Neck pain is an increasing problem, especially in areas where workers tend to be more sedentary. Somewhere between 22% and 70% of the American population will experience neck pain at some point in their lives, with 0.08% of these cases stemming from a pinched nerve in the neck (Childs et al 2008) (Cleland et al 2005). The following article will provide a brief overview of the background, causes, symptoms, and simple exercises for a pinched nerve. What is a pinched nerve in neck? This condition is also known as cervical radiculopathy – so what is it? The neck contains bones called vertebrae that stack on top of one another. Encased in these bones is the spinal cord which eventually gives way to nerves that supply the arms. These nerves exit from the spinal cord and travel between the bones in the neck and go into the arm. 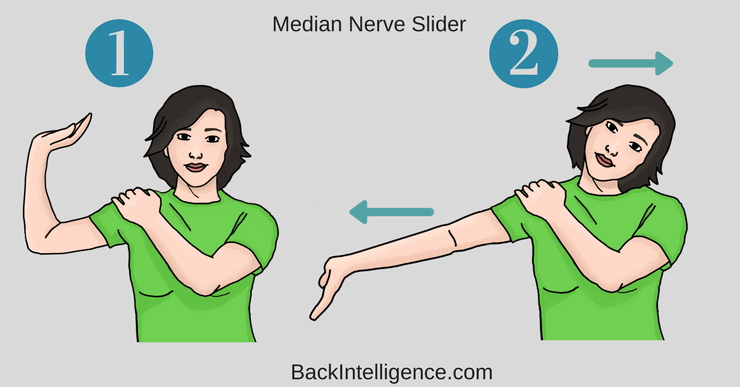 When one of these nerves become compressed or irritated, the resulting condition is a pinched nerve. In almost all my patients poor posture is the main cause. Bulge of the disc that sits between vertebrae which will compress the nerve exiting from the spine in that area. Inflammation of the area where the nerves exit the spine and travel into the arms. More bone being laid down around the neck bones which can compress the nerves exiting from the spine. These symptoms can vary in location based on the exact nerve involved. Note: In my experience, this condition can be difficult to diagnose because the symptoms could simply be elbow pain or shoulder pain. Many times, a patient will come to me with a diagnosis of elbow tendonitis, when actually the root cause of the symptoms is an irritation of a nerve in the neck. As you can see, this condition can be easily misdiagnosed. As mentioned previously, the most common cause of this condition is poor posture for extended periods of time. So the key is to fix your posture for sustainable relief! Poor posture will either directly lead to inflammation and irritation of the nerve in the neck, or it will lead to degenerative changes that may compress the nerve years in the future. So, what can be done about this condition? Exercise and stretches are often a viable option, and occasionally surgery is an option as well. Surgery is more commonly considered when severe weakness is found in the arm. However, Heckman et al found that 26% of people who go the surgery route continued to have pain 1 year after surgery, so it’s not a “quick fix”. I often tell my patients with this condition that surgery should be an absolute last resort unless the physician feels it is a medical emergency. A pinched nerve in the neck is commonly very treatable with exercise and lifestyle modifications. Below are five effective exercises to alleviate pain and begin to correct faulty posture commonly seen with this condition. It should be noted that every person is different, so not all exercises will work for everyone. If you experience pain with any of these exercises you should stop performing them immediately. 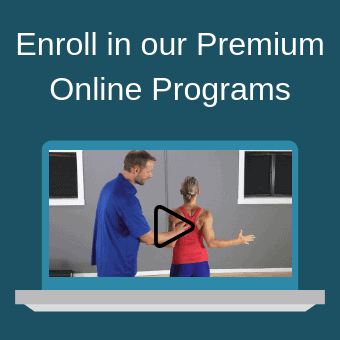 The first 3 exercises are helpful to combat the immediate symptoms, while the last 2 are postural exercises so you can can start fixing the root of the problem. This exercise will help to open up the joint spaces in your neck to provide relief of the compression on the nerve. Begin sitting in an upright position, shoulders slightly back, head looking straight ahead. It might be easiest to begin doing this in front of a mirror. Make sure not to open your mouth with this movement. hile holding this position, slowly look down towards your chest with your entire head. Hold this position for 10 seconds, then repeat it 10 times. Remember to keep the “tucked” position the entire time. This exercise will help to relieve tension on the nerves coming out of the neck as they travel down your arm. This exercise may or may not be appropriate for you depending on which nerves are involved. Again, begin in upright position with shoulders slightly back and head facing forward. Using the arm in which you are having symptoms, bring your arm out to the side and the palm of your hand towards your head, similar to the “flex” position for body builders. 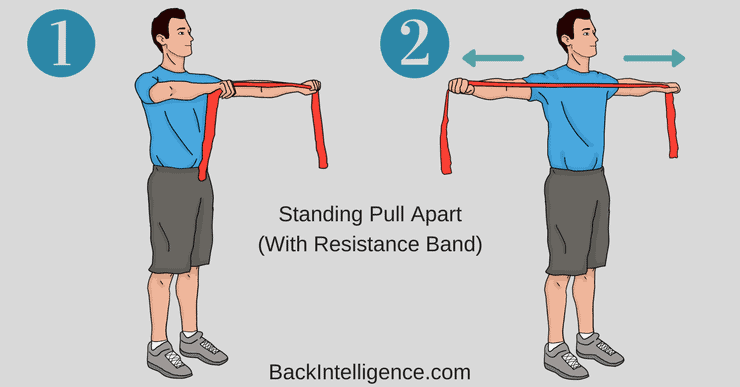 With the opposite arm, place it on top of your other shoulder. Slowly straighten your elbow and extend your wrist and fingers. You should feel a stretch along the inside of your arm. While straightening (the “flexed”) elbow, slowly bring your ear towards your other shoulder (Opposite to the arm that is straightening) . Continue to straighten your elbow as far as comfortable. If you begin to feel pain or numbness, return back to the start position and only perform the exercise in a comfortable range. Repeat 10-20x, depending on your symptoms. 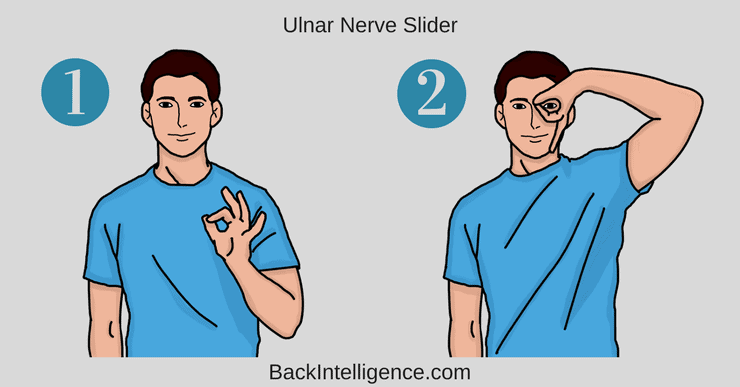 This exercise is done with the same intention as the previous exercise, however it targets a different nerve. Again, this exercise won’t be appropriate for everyone, so if you notice a significant increase in pain with this exercise, it may not be appropriate for you. Just the same as before, begin in an upright position with good posture. Make an “O.K.” symbol with your fingers. Slowly bring your elbow out to your side, raise your arm up, and place your three fingers not making the “O.K.” sign on your jaw bone (just to the outside of your chin). Then bring your fingers making the “O” portion of the sign toward your eye. Again, you should feel a stretch with this- maybe in your elbow, maybe in your ring and pinky fingers. Just as with the previous exercise, only perform within a comfortable range. 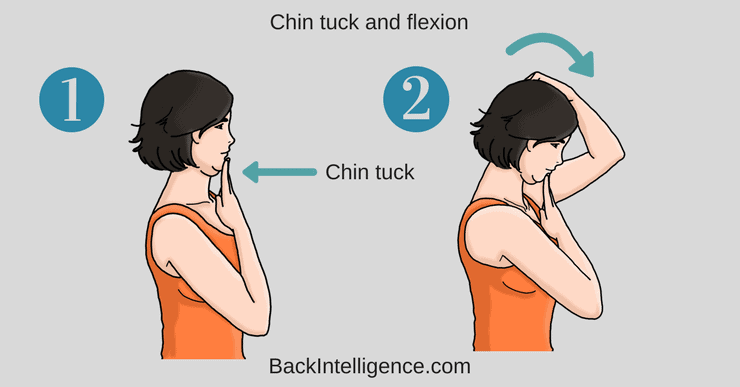 This is another version of the first exercise, however its goal is to strengthen the muscles on the front part of your neck which typically become lengthened (weakened as a result) with poor posture. If these muscles are weak, it becomes very difficult to maintain proper posture while sitting. While lying on your back, perform a chin tuck just like in the first exercise, however don’t look down toward your chest. From this position slowly lift your head up off the bed/floor (whatever surface you are on) only about 3-4 inches. Hold this position for 5 seconds, then return to the starting position. Begin with 10 repetitions and gradually increase to 20-30x. Remember to keep breathing while doing this movement. The last exercise of the series is focused on posture. This will help strengthen the muscles between your shoulder blades and on the back of your shoulders to ultimately allow you to have the strength to maintain proper posture. Give these exercises a try and see how they feel for you. Treating a pinched nerve in the neck is not a “no pain no gain” situation and you should truly listen to what your body is telling you while you’re doing these exercises. I also must emphasize again that this condition can be difficult to diagnose and if you begin performing these exercises and your symptoms worsen, they are not the solution and I highly recommend you see your physical therapist for further diagnosis. 1. Childs, J.D., Cleland, J.A., Elliott, J.M., Teyhen, D.S., Wainner, R.S., Whitman, J.M., Sopky, B.J., Godges, J.J., Flynn, T.W., Delitto, A. and Dyriw, G.M., 2008. Neck pain: clinical practice guidelines linked to the International Classification of Functioning, Disability, and Health from the Orthopaedic Section of the American Physical Therapy Association. Journal of Orthopaedic & Sports Physical Therapy, 38(9), pp.A1-A34. 2. Cleland, J.A., Whitman, J.M., Fritz, J.M., Palmer, J.A., 2005. Manual Physical Therapy, Cervical Traction, and Strengthening Exerises in Patients with Cervical Radiculopathy: A Case Series. Journal of Orthopedic and Sports Physical Therapy, 35(12), pp. 802-811. I was having numbing sensation in my left arm, the numb/tingling would get so bad that it felt as if a hot poker was being stuck through my hand! I started doing your excessive faithfully and no more issues!! Thanks so much for the article and excersises! I am having severe pain in my left shoulder blade,left arm and hand,tingling,numbness and burning,what is it? Probably a pinched nerve in your neck, I had them same symptoms. Elle, it could be a pinched nerve, but I can’t tell you for sure. Please see a medical doctor to diagnose your condition. 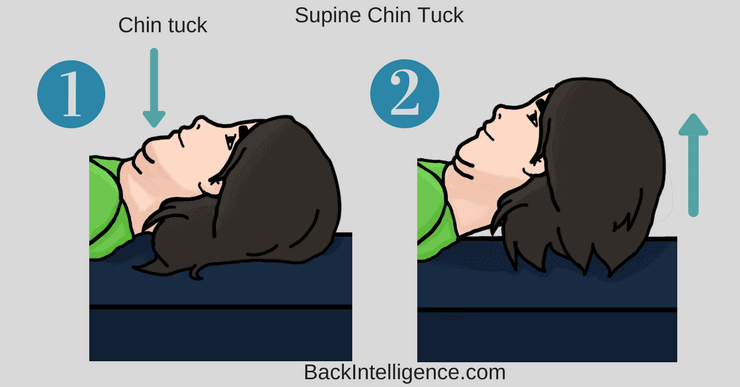 chin tucks increase pain in side of neck. Turning to look outward hurts. I know the doctor can’t do anything if I don’t want surgery. Any other advice? I can’t take NSAIDs either. I have a pinched nerve C6 right side with discomfort on right side of neck and shoulder. This was confirmed by EMG. I don’t want surgery and need exercise help to relieve discomfort. Just came across your website today and will try the exercises suggested. Will get back to you in a few days to let you know. Did you try these exercises?